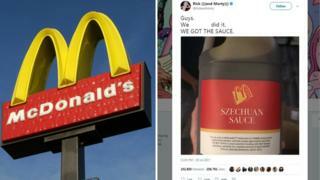 A McDonald's PR stunt to bring back a rare dipping sauce left thousands of fans disappointed, with police called to some US restaurants on Saturday. Officers also attended other stores because hundreds of people turned up. The sauce became a meme among fans of the adult animated science-fiction series after it was featured in the third series. McDonald's announced the Szechuan's return last week, describing it as a "really, really limited release" to special locations in the US. But fans online said some restaurants claimed they were only given 20 pots of the sauce per venue, while others received none. Fans took to social media to vent their frustrations after being unable to get their hands on the out-of-production dip. One couple posted that they had driven for four hours to a restaurant stocking the sauce, but were left disappointed. The global fast food chain apologised to fans on social media but repeated their warning that the release was going to be "super limited". Pots of the sauce are now listed for sale on online auction websites for hundreds of dollars. Angry customers posted pictures of breaded chicken and dipping sauces from other fast-food chains in protest at the stunt. Others posted pictures of large bowls of the sauce they had made for themselves at home.